What makes up the fabric of Cheyenne? Cheyenne is the Capitol of Wyoming. It is known to be much more though. It is known for the generous people who comprise the community. 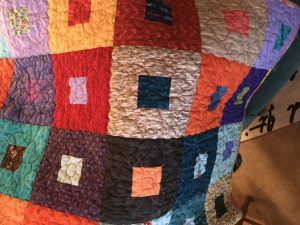 The quilt which is featured is created by a local resident monthly. She designs each one herself to express a different artistic flair each time. She then donates these quilts to the Cheyenne Regional Medical Center Cancer Center. There, they gift a quilt to an individual who is currently going through cancer treatments. It is a true example of the phrase, “Labor of Love.” Cheyenne, our community, it is really a labor of love. Every person who lives here will tell you that they don’t just invest in the community to just simply have a home but to be a contributing citizen. We are one large family and that is what makes our area so unique. Personally, that is why we raise our kids in this community. We have three amazing kids and all of them are surrounded by a support system that far exceeds their own relatives. Their friends, our neighbors and even fellow RE/MAX Capitol Properties’ employees and those in the industry- they are there to support and help. We each contribute to the grand design whether we help with a small stitch which results in a newly admired textile or the color in the fabric which evokes so much emotion. Our community is incredibly kind, warm and welcoming. That is why we at RE/MAX Capitol Properties are thankful to help connect families with their homes in our town. We get to play a small part in a larger picture.